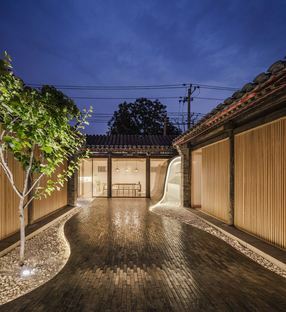 Archstudio gave the name Twisting Courtyard to a renovated siheyuan, a traditional courtyard home in central Beijing. 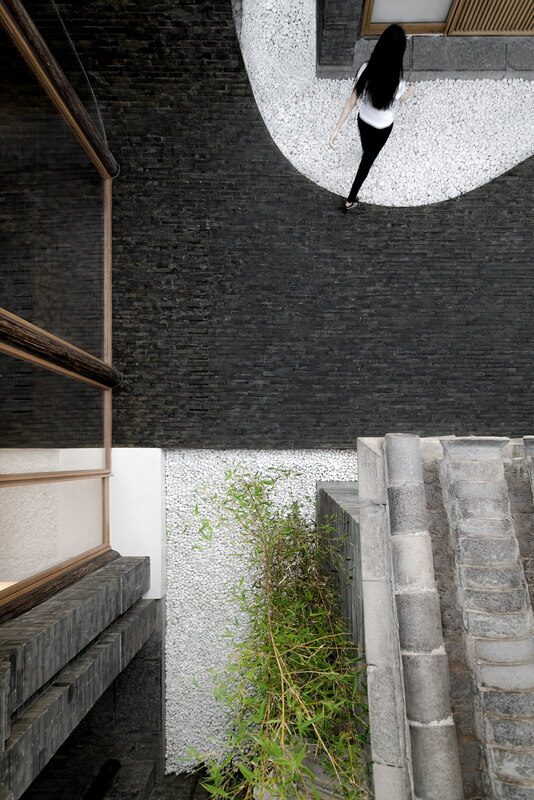 In the Dashilar district, Han Wen-Qiang of Archstudio reclaimed a courtyard home for mixed public and private use. 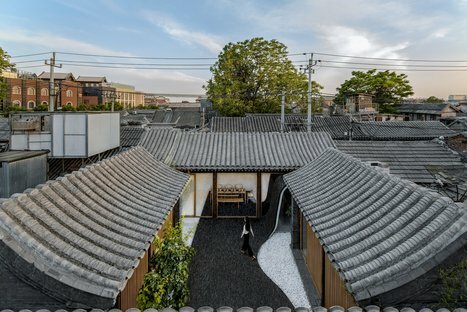 Han Wen-Qiang of Archstudio planned an interesting renovation project in a siheyuan, a traditional house arranged around a courtyard, in Beijing’s Dashilar district. The project confirms the Chinese studio’s interest in urban regeneration, already visible in the Great Wall Museum of Fine Art installation in an industrial area in the former pharmaceutical factory of Zi Bo. Located in Beijing’s Inner City, the siheyuan in question required modernisation of spaces and services in response to the new demands of life and commerce in China’s capital city. In recent years Beijing has been moving ahead with (or, some would say, suffering from) a gentrification process, rebranding itself as cosmopolitan city in which it is imperative to leave behind the city’s past of poverty and introduce a new profit-oriented economy. “Getting rich is glorious”, Deng Xiaoping is said to have declared back in the 1970s. There has, however, been more resistance to this standardisation of the cityscape in the Dashilar district than elsewhere, with a greater focus on mediation with the past in the local architecture. The entrance to the siheyuan, now called the Twisting Courtyard, is clearly oriented toward preserving the marks of history, and restoration of the entrance heralds the modernisation of the building’s interior, with its wealth of detail. The walls around the courtyard have been restored, and the internal subdivision into four volumes facing the courtyard has been maintained: two longer ends and two smaller central ones. 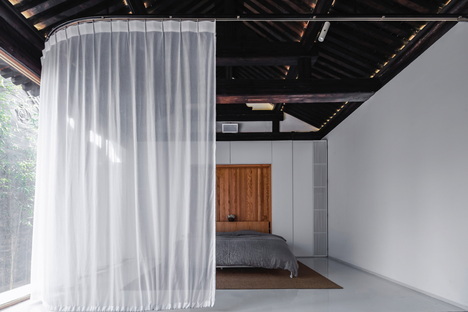 As the siheyuan is now used for a variety of purposes – it contains bedrooms but can also be rented to host public events – Archstudio’s goal is to present a building made up of separate but related parts. They achieve this by preserving the original appearance and individuality of the four volumes overlooking the courtyard with their pagoda roofs, while at the same time using the same flooring in all parts of the building to establish continuity between its parts. To ensure the reversibility required to convert bedrooms into semi-public spaces, such as reception or entertainment areas, the architects designed wooden boxes in the stone spaces: true rooms within rooms, incorporating mobile furnishings which can if necessary be folded away into the walls (murphy beds and tables emerging from openings in the floor). Great cleanliness of form aids the process of adaptation of the space from residential to convivial. Wood and glass, widely used in the renovation project, are materials chosen with great care to achieve this; the walls facing the courtyards of the two end volumes have been replaced with floor-to-ceiling windows dialoguing directly with the inner garden, with curtains that can be closed to darken the rooms. The oak walls and furnishings create a homelike, hospitable atmosphere. A touch of bold modernity is added by the stone tiles forming a path from the entrance, along the courtyard, and from room to room and even become three-dimensional in two places in the end volumes, rising up to form new spaces. The flat floor puts all the spaces on the same level, eliminating the slight differences in level characterising historical buildings, and becomes three-dimensional to conceal the utility areas, bathrooms and kitchen, additions to the new layout of the siheyuan. 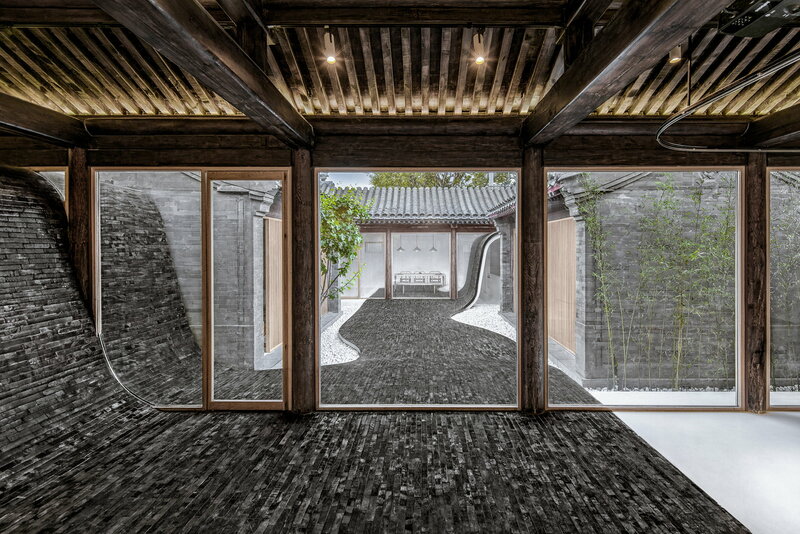 In the Twisting Courtyard, the traditional and the contemporary come together to create a space that is hard to define but continues to evoke the buzz and dynamism of the traditional Chinese courtyard.